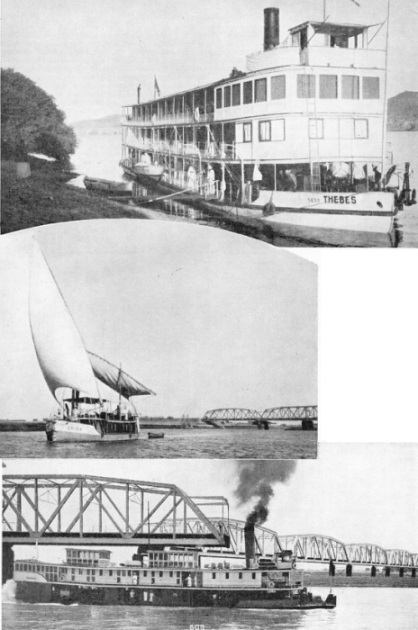 A TYPICAL PADDLE-WHEELER on the River Nile, the Sudan is employed on the passenger services run by Thos. Cook & Son, Ltd., between Cairo and Aswan This firm builds and maintains its own vessels in the shipbuilding yard at Boulac, near Cairo. The Sudan is here seen approaching Aswan. FEW waterways can compare with the River Nile for romance. The waters of this wonderful river bring life to what would otherwise be a barren, rainless desert, and the great stream has been the mainstay of a large population for countless generations. The River Nile saw first the raft of reeds, then the boat made of reeds and wood, and later the sea-going ship of the ancient Egyptians. To-day, as in the past, the Nile is a great highway of commerce and the main artery of Egyptian life. During its course through Egypt it flows through country where so little rain falls that the thirsty sand cannot yield one tributary stream. Even more remarkable is the fact that the river brings to Egypt the fertile silt that makes the land productive. The Egyptians gather the silt from the river and spread it over the barren sand. In this way they are able to produce crops that not only suffice for domestic needs, but also are abundant enough for export. The level of the flood water of the Nile was once the measure of Egypt’s prosperity. Rulers at one time built nilometers, gauges that measured the height of the flood water. By these gauges was estimated the amount of taxes the land would yield. Within recent years huge barrages have been constructed to hold back the water on its way to the sea and to open up new areas for cultivation by means of irrigation. These barrages, or dams, have been built in the Sudan as well as in Egypt and give the native farmers a regular supply of water throughout the year, and not merely in the flood season. Shallow-draught stern-wheel steamers now maintain a regular service throughout the year from Khartoum for over a thousand miles through country which for thousands of years had defied travellers. So much soil is brought down by the river that it cannot become a highway for ocean-going vessels. It is impossible to travel in an ocean-going steamship for hundreds of miles up the Nile, as it is up the Amazon, in South America, or up the Yangtze Kiang, in China. Below Cairo, the capital of Egypt, the river has formed a delta and the channels are continually changing. Although dams have been built, and some of them have locks to permit the passage of river boats, the presence of a series of cataracts and the many shoals make the Nile impassable for large ships. The Nile delta forms a triangle, with Cairo as the apex and the Mediterranean coast as the base. Steamboat navigation by passenger vessel begins at Cairo and this service operates up to the First Cataract and the barrage at Aswan (or Assuan). From Shellal, the port of Aswan above the cataract, another service runs to Wadi Haifa, on the Sudanese side of the border. Passengers for Khartoum leave the steamer at Wadi Haifa and take the train. The railway leaves the Nile at Wadi Haifa, to short-circuit the wide sweep of the river and regains the Nile at Abu Hamed. There is a steamer service on this reach, from Kareima, the terminus of a branch line from Abu Hamed. downstream to Kerma. BETWEEN ASWAN AND WADI HALFA plies the river steamer Thebes. She is a stern-wheeler, with three covered-in decks and is used for the extensive tourist traffic which is a feature of the River Nile. Tourists from Cairo transfer to the Thebes at Aswan, which lies between Luxor and Wadi Halfa. A SIXTY-FEET GAIASSA belonging to the Sudan Government and named the Amira. The high-peaked lateen sails are designed to catch the wind that blows over the banks of the Nile without descending to the water. The Amira, with a beam of 17 feet, has a saloon and two cabins, as well as a bathroom and accommodation for a native crew. PASSING THE SWING BRIDGE at Khartoum (shown also in the central illustration) is the Omdurman II, a Sudan Government stern-wheeler. This vessel is 122 feet long, with a beam of 24 feet. She has accommodation for twenty-two passengers. The lowest tributary of the Nile, the Atbara River, flows into the Nile at Atbara, in the Sudan, below Khartoum. This river, about 700 miles long, rises in Abyssinia and brings down fertile sediment from the mountains. From June to September it is navigable for about 200 miles above Atbara. At Khartoum, the capital of the Sudan, the White Nile and the Blue Nile meet. Above Khartoum steamers maintain a regular service for nearly 1,100 miles to Juba, and also to Wau, on the Bahr-el-Ghazel, a tributary. There are other services in the high-water season to Gambeila in Abyssinia, on the Sobat River, and to Roseires on the Blue Nile. water, for less than one-seventh of the total volume is supplied by Lake Tsana. The Blue Nile is joined by other rivers between the Sennar Dam and Khartoum. 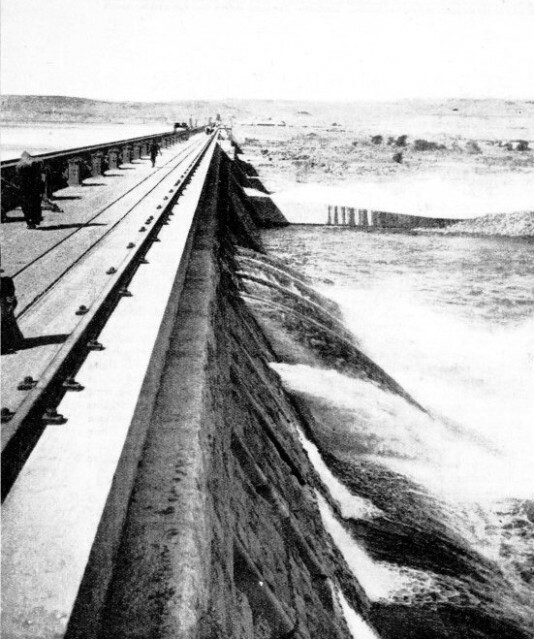 The Sennar Dam, opened in 1926, is about 170 miles from Khartoum. About a mile and three-quarters long and 107 feet high, the Sennar Dam diverts the water of the Blue Nile into thousands of miles of irrigation channels. The White Nile forms the highway from Khartoum to the heart of Africa. Upstream, the first tributary is the Sobat River, which flows from Abyssinia into the White Nile 534 miles from Khartoum. The main stream of the White Nile turns south about 615 miles from Khartoum and becomes the Bahr-el-Jebel. The steamer terminus up the main stream is at Juba, whence roads radiate to Kenya, Uganda and the Belgian Congo. Beyond Juba several rapids interrupt navigation. Travellers go by motor passenger lorry to Nimule, from which point they take a steamer to Butiaba, on Lake Albert. Nimule is in Uganda, and the distance thence by steamer to Butiaba is 200 miles. The next portion of the river is known as the River Kafu, which flows into the northern end of Lake Albert through Lake Kioga from Lake Victoria. Lake Victoria is 3,726 feet above the sea, and some of the steamers on the lake are of over 1,000 tons register. The three cascades of the Murchison Falls, which carry the water down for 400 feet, prevent the navigation of the river between Lake Albert and Lake Kioga. Navigation is also rendered impracticable by the Ripon Falls, where the Nile flows out of Lake Victoria on its meandering journey of nearly 4,000 miles to the Mediterranean Sea. The sources of the Nile puzzled the ancients and were not discovered until the middle of the last century. It was the shallow-draught steamboat that enabled the upper reaches to be opened up. On the lower and middle reaches of the Nile the river steamers cater for the European tourist, and these craft are luxuriously furnished. The passenger services in Egypt are operated by Thos. Cook and Son, Ltd., the Anglo-American Nile and Tourist Company, and, above Shellal, by the Sudan Government and by Cook’s. The largest vessels of Cook’s service are the Arabia, the Sudan and the Egypt, sister ships, which run between Cairo and Aswan. They have three decks, of which the topmost is 50 feet wide. This deck contains a large open lounge, with sliding wind-screens and a glass-enclosed observation room forward. The dining saloon, on the saloon deck, has large windows, so that passengers may watch the scenes on the river while they are eating. THE ASWAN DAM is a mile and a quarter long and has 180 steel sluice gates. It cost over £5,000,000 to build and was opened in 1902. The dam is situated three miles south of the town of Aswan. River steamers from Cairo ply on the River Nile as far as Aswan. From Shellal, above the Aswan Dam and the First Cataract, other steamers run regular services upstream to Wadi Haifa. These vessels are too large to pass through the locks at the barrage at Aswan, and Cook’s service from Shellal to Wadi Haifa is maintained by the Thebes, a smaller vessel. The three larger boats are paddle-steamers, and the Thebes a stern-wheeler. In addition there are private steamers for hire, of which the largest is 131 feet long, with a beam of 19 feet, and 150 horse-power engines. These vessels were built at the company’s shipyard at Boulac near Cairo. 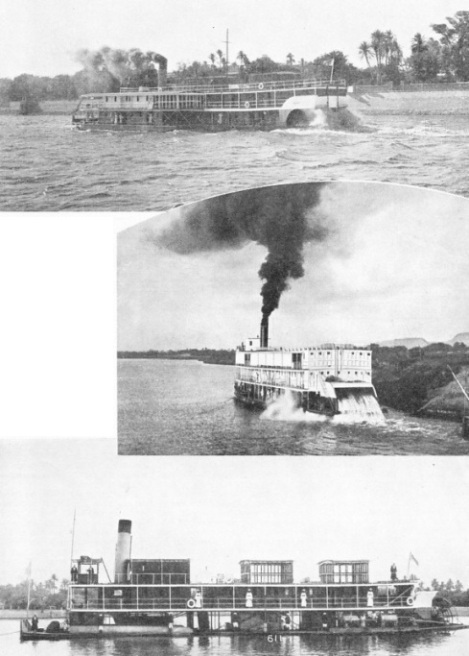 Mr. J. M. Cook, son of the founder of the firm, started one of the first regular steamboat services on the Nile in the 'seventies and secured the mail contract After the revolt of 1882 these steamers were placed at the disposal of the British Army for carrying sick and wounded troops, and when General Gordon went to the Sudan, Cook’s were asked to convey him as far as Korosko. Later they took 11,000 British and 7,000 Egyptian troops and vast quantities of stores up the Nile to the Second Cataract at Wadi Haifa in twenty-seven river steamers and 650 sailing boats. Twin-screw ferry steamers have been built at Cook’s yard for the Egyptian State Railways. The draught of these vessels does not exceed 3 feet, and the propellers operate in specially constructed tunnels. With their twin screws and a large balanced rudder, these boats are easily handled in narrow parts of the river. Another interesting type of vessel is a scouring barge used for cleaning silt from locks. A heavy plate is lowered from the stern of the barge into the lock so that the water flows under the bottom of the plate, and the force of the current scours away the silt in the bottom of the lock. Steam barges are used to take cargo from towns on the Nile through the canal to Alexandria. They carry from 220 tons to 280 tons of cargo, according to the depth of water in the canal. There are some seven vessels operated by the Sudan Government south of Aswan on the Wadi Haifa reach. The largest of these vessels is 160 feet long, 26 feet beam and has seventy-four berths. The steamers have three decks, and their maximum draught is only 3 ft. 6 in. The smallest steamer is 100 feet long, with a beam of 23 feet, and has twenty-two berths. The Nile services of passenger steamers, private hire steamers, steam and motor launches, and dahabiyas (lateen-rigged passenger boats) afford a pleasant way of seeing the wonders of Egypt, ancient and modern. The huge barrages, engineering masterpieces of modern civilization, are as wonderful in their way as the Pyramids, the Sphinx and the temples and tombs of the ancients. The sunshine and almost rainless air have preserved these relics of the past, so that the narrow strip of land on either bank of the river retains many monuments which are important in the story of mankind. Along the highway of the river there arose an ordered civilization with palaces, temples and monuments. The rich volcanic soil brought down from the Abyssinian highlands by the Blue Nile and the Atbara River was spread over the land by the industrious peasant and watered by the river floods Under the hot sun crops flourished. To-day the fellaheen, the industrious Egyptian farmers, work by the same methods, and sometimes with the same primitive form of pump, as their forefathers. To the ancients the Nile was Hapi one of the cosmic gods, and water was symbolic of the division between life and death. Across the symbolic stream the soul of the king was borne first on a raft of reeds, and then, when the legend had outlasted invention, in a boat. THE COURSE OF THE NILE runs from Lake Victoria, 3,726 feet above sea-level, to the delta on the coast of the Mediterranean Sea. The Blue Nile flows from Lake Tsana or Tana in Abyssinia for more than 800 miles and joins the River Nile near Khartoum. The Atbara River also rises in Abyssinia and flows into the Nile north of Khartoum at Atbara. Men had to remain near the river, because away from it there was nothing but the desolation of the desert. Towns flourished along the stream, and nobles travelled in ornate state craft; food and goods were borne up and down the river in humbler boats. The Egyptians found it easy to sail downstream with the current, which in flood time was swift. Although it was not so easy to work upstream, they were assisted by the prevailing wind of Egypt, which blows from a northerly direction and therefore against the stream. The Egyptian learned something of the art of sailing. The first sails had a straight yard, but in later years the Arab idea of the lateen sail was adopted with its long, curved yard that can be peaked up high without the need of a tall mast. This became the typical rig of the Nile craft, and persists to this day. From the dawn of history until the end of the last century the Nubian frontier was a constant danger to the rulers of Egypt. Wadi Haifa, 210 miles from Shellal, is the most northerly British post in the Sudan and marks the limit of steamer navigation in this reach of the Nile. Wadi Haifa was important during the Nile Campaign for the recovery of the Sudan and, before this, during the Gordon Relief Expedition. To get the boats of the relief force up the cataracts above Wadi Haifa, soldiers dragged them through by towing from the banks. After the failure to relieve General Gordon at Khartoum, gunboats patrolled the river from Wadi Haifa to Shellal to protect the frontier from Dervish raids. When a final campaign was decided upon, four gunboats and three armed steamers were collected at the foot of the Second Cataract to await the rise of the river. Three new gunboats were ordered from Britain to be sent out in sections and taken by the military railway to a point above the cataract. These three gunboats were stern-wheelers, 140 feet long with a 24 feet beam and an armament of one 12-pounder, two 6-pounders and four Maxim guns. The vessels were assembled in the remarkably short time of eight-weeks. The native boats - gaiassas and the smaller nuggars - were hauled up the Second Cataract, but the seven steamers presented a difficult problem. They had to climb about 60 feet in nine miles, and at one place the stream was only 35 feet wide, with a sheer climb of five feet. Guns and ammunition were taken out, all fires were drawn, bulwarks were built to prevent swamping, and at the worst place two thousand men hauled on the cables. It took ninety minutes to haul a vessel fewer than a hundred yards, but in a week all seven were in the upper reach. The next cataract, at Amara, was much easier to negotiate. Kaiber Cataract and Hannek Cataract were also negotiated without great trouble. Not many years have passed since those days of strife, but great changes have taken place. Khartoum and Khartoum North are connected by a bridge that spans the Blue Nile, and another bridge crosses the White Nile to link with the native town of Omdurman, which has more than 110,000 inhabitants. EXTRA ACCOMMODATION for passengers in the Gedid II is provided by a barge which is towed alongside. In narrow waters, the Nile steamers push these passenger barges ahead of them. The Gedid II is a sister ship to the Omdurman II illustrated above. THE FERTILE BANKS of the River Nile, as a Sudan Government stern-wheeler passes. The parched land relies solely upon the waters of the Nile for irrigation, and without the annual inundations of the river the whole country would be a desert. It is only in the area reached by the river floods that cultivation is possible, but in this area the soil is among the most fertile in the world. THE LOW FREEBOARD of many Nile steamers is permissible only because the river is not subject to storms or heavy seas. The typical passenger steamer shown below is one of the stern-wheelers employed by the Sudan Government above Aswan. The river steamers on the service from Khartoum to the south are restricted to a draught of 3 ft. 3 in. The largest craft is 157 feet long with a 24 feet beam; others are 150 feet long by 33 feet beam; the smaller boats are 86½ feet long by 17½-18½ feet beam. The horse-power of the larger boats is 144, and all are stern-wheelers. Wood fuel is used. Most of these boats were built in Britain, taken to pieces, and reassembled either at Wadi Haifa or at Khartoum North. Extra accommodation is provided by passenger barges which the steamer tows alongside in wide reaches and pushes forward in narrow waters. There are also gaiassas ranging up to 60 feet in length, and lateen-rigged, with two masts. More than 2,400 miles of river are served by the Sudan Government steamers. Khartoum, 1,200 feet above the sea, is 1,700 miles by river from Cairo. The dockyard and boatyard of the Steamers Department is at Khartoum North, and here the Bordein is kept, the only survivor of Gordon’s gunboats. Although not so luxurious as the palatial craft on the Lower Nile, the White Nile boats are well equipped and comfortable, with electric light and fans, bathrooms and saloons. They penetrate far into the heart of Africa. The bed of the River Nile rises several inches in a century owing to the mud it brings down, and the delta has changed considerably. At one time the Nile had seven mouths, but now there are only two, at Rosetta and Damietta. The traveller lands from the ocean liners at Port Said or Alexandria, and takes the train thence to Cairo. Alexandria, at one time the greatest port in the world, has, after a long decline, revived and become the second city of Egypt. Founded by Alexander the Great the city became a centre of learning as well as of trade. In time, however, the harbour and the canals linking it with the Nile silted up. In 1820 the ruler of Egypt, Mehemet Ali, cut the Mahmoudieh Canal, thirty-six miles long, at the cost of 25,000 lives, and a new harbour was built. To build the canal, more than 250,000 men were enslaved and forced to dig without tools by scraping out the earth with their hands and filling baskets with soil. Later Mehemet Ali decided to build a barrage near Cairo to dam the Nile, and when a French engineer suggested a stone embankment, Ali told him to use “those great useless heaps of stone, the Pyramids”. The engineer replied that the cost of tearing down the Pyramids would be greater than that of quarrying new stone, thus saving the Pyramids and his reputation. The work was finally completed by British engineers. The famous Aswan dam was designed by Sir William Willcocks and was completed in December, 1902. The 180 sluice-gates of its mile-and-a-quarter length are opened during the flood season. As the floods subside the sluices are gradually closed to retain the water on which the irrigation of Egypt depends. In 1912 the height of the Aswan dam was increased, and the capacity of the reservoir rose from 1,307 to 3,165 million cubic yards. These great modern engineering feats, these dams and barrages, as well as the monuments of ancient civilization, combine with the natural beauties of the cataracts and of the upper reaches of the Nile to make a voyage up the river a unique experience. Although the river steamers are puny in comparison with ocean liners, this voyage up the Nile is more remarkable than many an ocean route, and the little river vessels make an important contribution to the wonderful story of the ship. A PASSENGER BARGE being pushed ahead by a Sudan Government passenger stern-wheeler on the River Nile. The modern motor-launch with its covered-in deck, shown in this photograph, strikes a contrast with the picturesque native craft, the gaiassas and dahabiyas, that are still to be met with on the Nile. You can read more on “The Battle of the Nile” and “A Gallery of Native Craft” on this website. You can read more on the Aswan Dam and the Sennar Dam in Wonders of World Engineering.